The reconnaissance version Mirage F.1CR was operated solely by the Armée de l'Air and was the last French version of the F.1 jet to remain in service, being withdrawn in June 2014. The last unit of the French military to field the Mirage F.1 was the Escadron de Reconnaissance 2/33 Savoie. Before their withdrawal, the reconnaissance Mirages had been used in campaigns in Chad, Iraq, Afghanistan, Serbia, Mali and Libya. Comparing the kit with Special Hobby's earlier Mirage F.1 models, this one has an additional sprue, making it possible to portray the model in a correct reconnaissance configuration. This sprue has been designed to contain Corail underwing chaff/flare dispensers used in the final stages of the Mirage F.1CR service, the air-cooling unit for the Cyclope thermographic sensor, or the unique tailcone mounted Lacroix flare dispenser. The decal sheet printed by Cartograf covers three French machines, each of them in a different camouflage scheme. 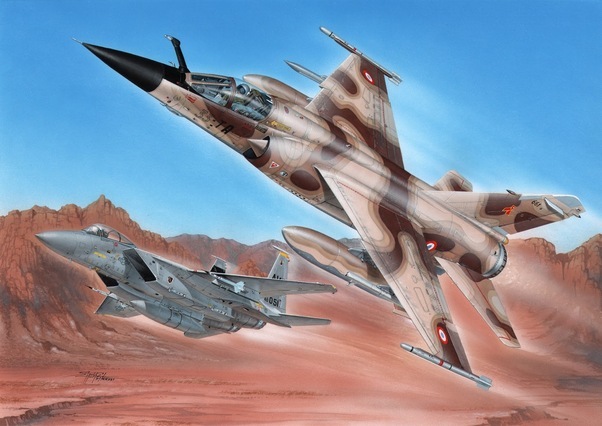 The Mirage with 33-TA fuselage codes wore very special four-tone camouflage used during Red Flag excercises in the USA in the late 80s and its nose section was adorned with a tally of two F-15 adversary fighters brought down. (see Box Art) Of interest may be the identity of the pilot responsible for this success, by the name of André Lanata, a young captain then, who currently has reached the top position in the ranks of the French Air Force, being the Chief of Staff of the Armée de l'Air. The second option is a desert-camouflaged machine that in the winter of 1987-88 took part in the Chad campaign, and the last one is a grey-green painted CR Mirage that saw action over the former Yugoslavia, operating in 1999 from Solenzara base, Corsica and participating in recce missions over Kosovo as a part of NATO launched Operation Allied Force.